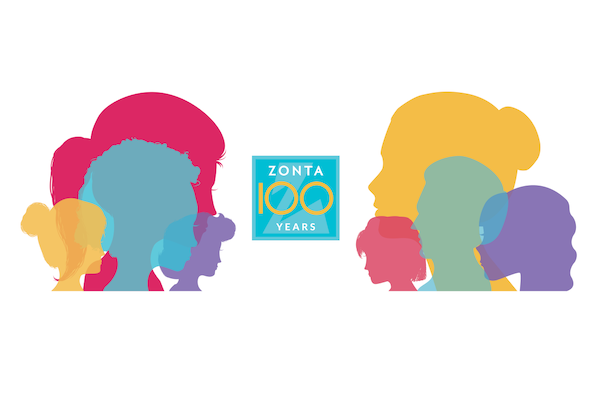 Zonta International has been empowering women for nearly 100 years through service and advocacy. 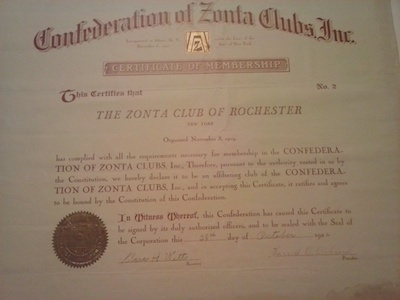 Starting back in 1919, Zonta’s founders worked to make a place for women at the table of professional organizations. For almost 10 decades, the work done by members at that table has been inspiring, motivating and life-changing. 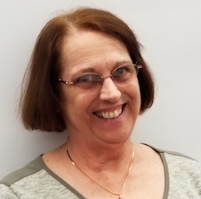 Now, in this biennium, Zontians honor those who have laid the groundwork for the future and empower the current and next generations to continue the mission. 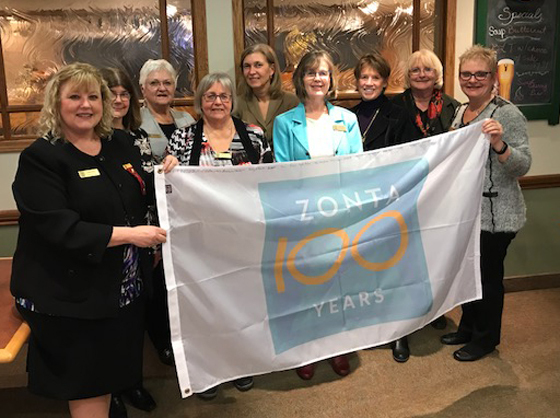 During this Zonta biennium our District will be brainstorming and reaching out to our clubs to encourage development & implementation of celebrations that honour and empower our members, the women around us, and women globally. 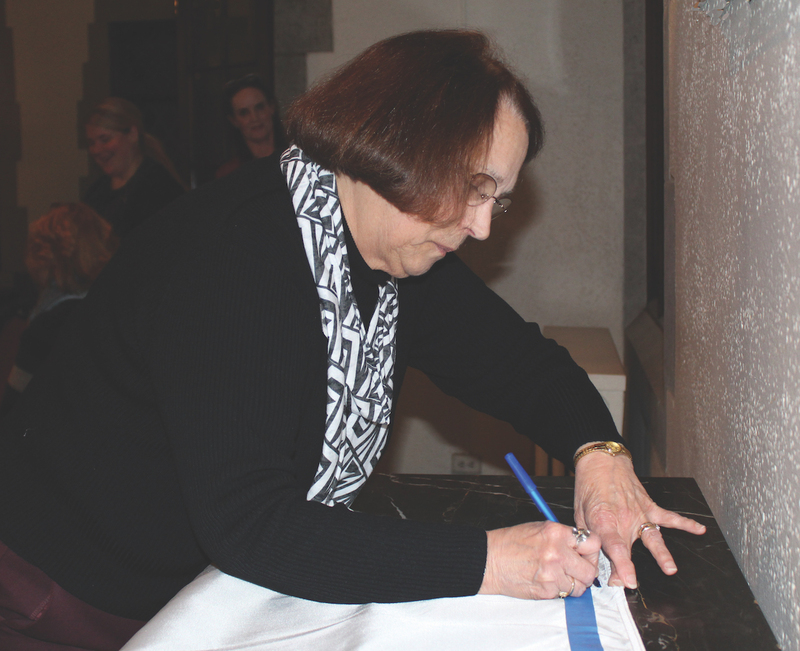 The traveling flag will move through our district’s six areas visiting each of the 35 clubs during this biennium. Club presidents will sign the flag along with the D4 Elected Officers. Along the journey the flag will rest at each of the three 2019 Area Workshops (Jamestown, NY, Kitchener, ON and Kenmore, NY), and in Buffalo during the D4 Conference from September 26 – 29th, 2019. 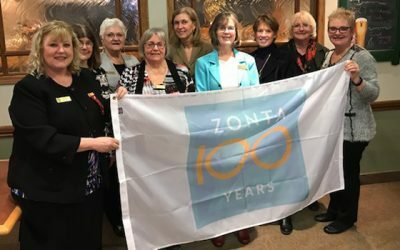 It will then resume its travel through the district until being brought to the 65th Zonta International Convention in Chicago, MO in June 2020. 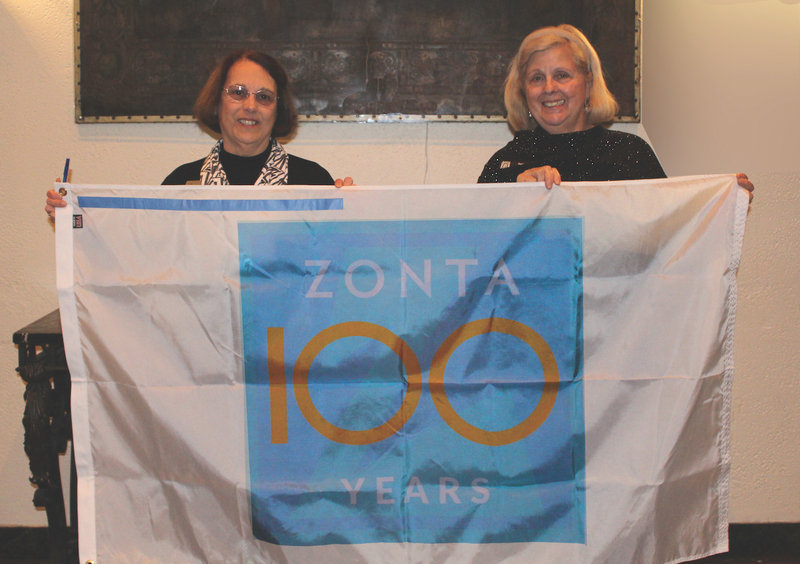 Zonta District 4 unveils Centennial Flag in Buffalo on Nov. 25, 2018 to kick off the Travelling Flag Project. 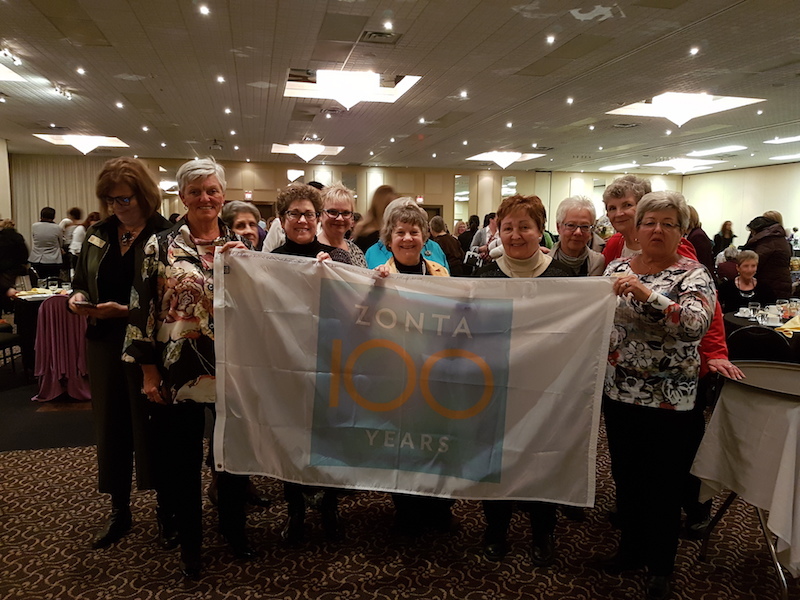 Centennial Travelling Flag with ZC of Kitchener-Waterloo members on Monday, March 4, 2019, at their International Women’s Day Comedy Night. 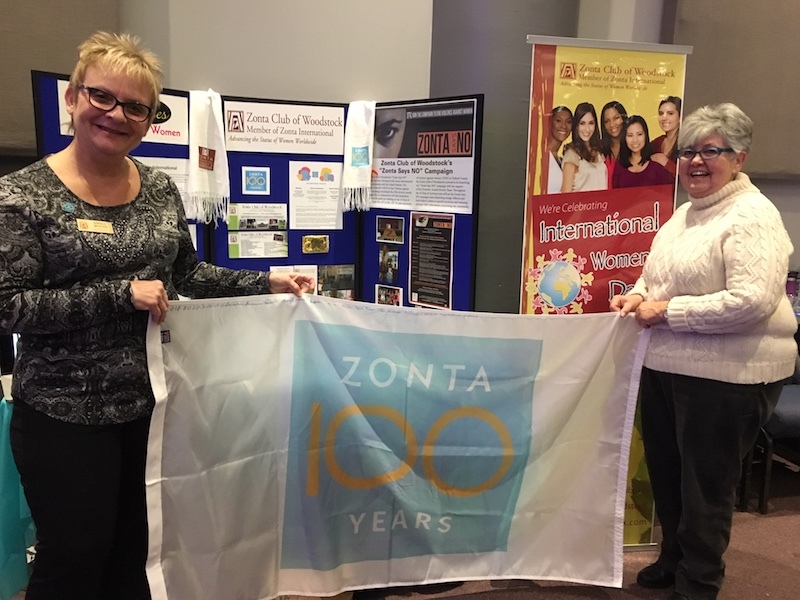 Centennial Traveling Flag presented to ZC of Woodstock President Marg McBurney (right) by D4 Area Director Brenda Graham at IWD event in Woodstock, ON on March 6, 2019. 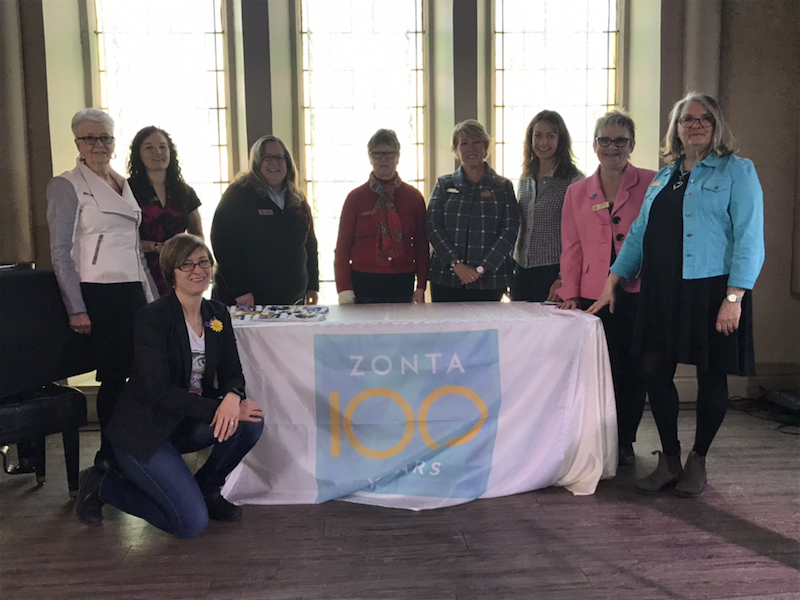 Stratford Zonta Club at their International Women’s Day Breakfast on March 8, 2019. 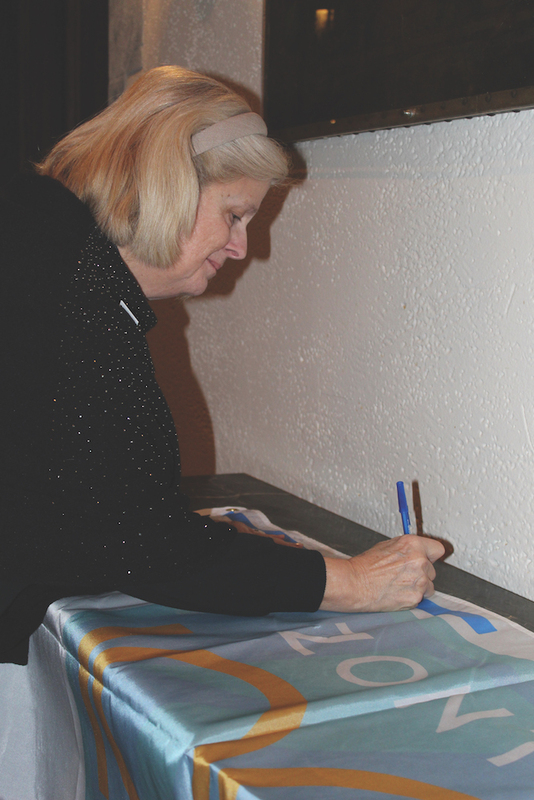 This was also the handoff of the Centennial Travelling Flag to Area Director Brenda Graham. YZC of Owen Sound members with the District 4 Centennial Travelling flag on March 20, 2019. The flag then is being transferred to Area 1 Director Brenda Graham. 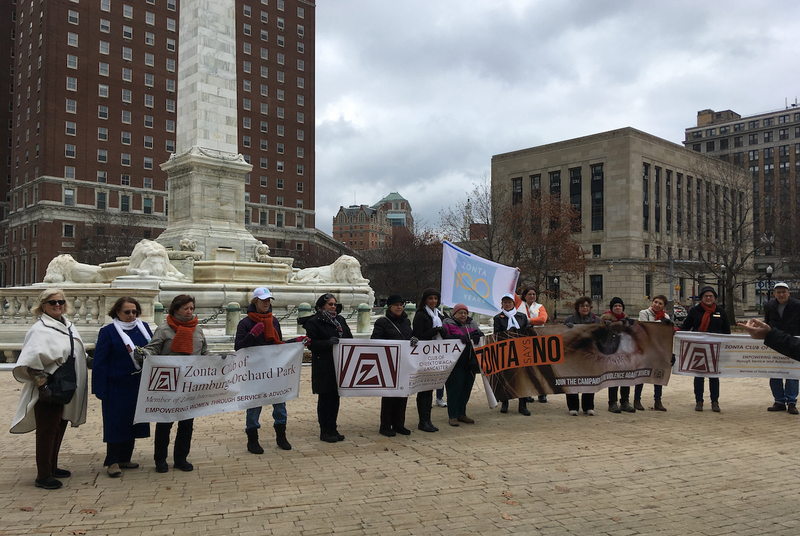 Centennial Travelling Flag with ZC of Guelph members on March 30, 2019, during their Centennial ‘So They Can Go Home’ – Moccasin Service/Advocacy Project. 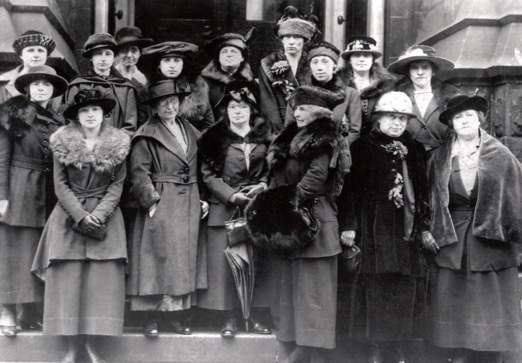 Do you know our history and where it all began? 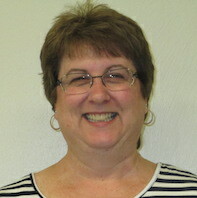 More information on our District 4 History web pages. 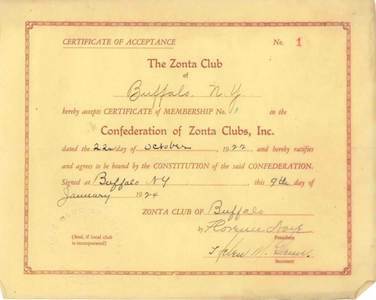 A few ideas to get your club on its way to celebrating this biennium. 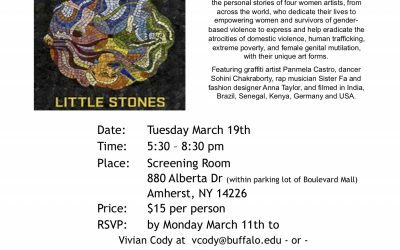 These ladies will be reaching out to our District to offer assistance and ask for your update on centennial club activities. Let’s Begin the Celebration Say Hello! This message will be directed to the Centennial Committee.